There's a lot of information out there about how a hiring decision is made. In reality, it all comes down to whether or not you will make the hiring manager's job easier. The better equipped you are to tackle the tasks of the job, the more time and money you will save your manager. Do you have the basic skills required for the job? How much experience have you had doing the work required for this job? What advanced skills do you have that are relevant to this job? How quickly will you be able to work independently? Will you be able to train others? Generally, the better you fit in with the team, and the corporate culture, the more likely you are to be hired. The hiring manager knows that if you're a good fit with the team, he or she won't have to spend time resolving personal conflicts between you and others on the team. A good team fit means you'll likely mesh with established patterns and procedures and, ultimately, help improve production. Managers also have to ask, "are you a good fit with the overall company culture?" Every hiring manager has a budget that covers the salary and benefits of a new hire and possible adjustments to the salaries of other team members if you're hired. If the hiring manager can hire you at the targeted salary, or below, he or she can stay within budget and not waste time and energy making adjustments. All managers will question how quickly you'll be able to get up to full productivity. If you require a salary above the target, the hiring manager may be able to accommodate you, but she has to figure out how to make adjustments. Another variable is whether or not you require additional benefits such as an extra week of vacation. Are your salary requirements at or below the target for the position? Are you requesting any benefits beyond the company's norm? Will hiring you require the hiring manager to make adjustments to any other team member's salary? Will hiring you require any additional effort on the hiring manager's part to justify any additional expense? Does the hiring manager believe you are worth the additional cost? No hiring manager operates in a vacuum. The manager has a boss that he or she reports to and has to please. 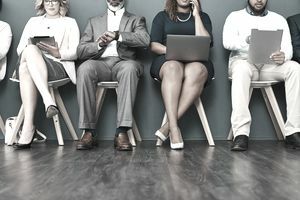 The position the hiring manager is filling will probably interact with other departments in the company, and the managers of those departments may have preferences for the kind of person being hired. Will hiring you cause any problems with the hiring manager's boss? What other departments will you work with and do any of them have preferences that you don't meet? Is hiring you going to cause any problems with the company's hiring practices that will take time or effort on the manager's part to explain or justify? Will hiring you cause any problems with government rules or regulations that the company will have to deal with and the hiring manager will have to spend time to support? A hiring manager is going to hire the candidate he believes will do the most to make his or her job the easiest. Every manager has more work than they can handle and while they recognize recruiting, screening, and hiring new employees is a critical part of their job, they'll always opt for the candidate who will do the most to help them out by making their job easier in all aspects. Would You Prefer a Vacation or PTO?